The book was released on February 17th, 2014 by on Amazon.com – the nation’s #1 place to buy books. The book is written specifically for Veterinarians that are looking to get more out of their online marketing. The internet marketing gurus of the world, know that video marketing is the way to go when planning any online marketing campaign. In this New Economy, animal hospitals and clinics need to utilize local marketing, mobile marketing, and video marketing, in order to get and keep clients. Video Marketing for Veterinarians is full of practical advice about the how to’s of video marketing. You can read for yourself the way that the experts in this book, guide you on the step by step process of video marketing online. 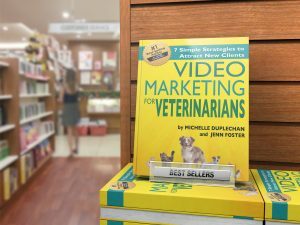 This book, Video Marketing for Veterinarians will help your animal practice soar to new heights on the search engines like Google, YouTube, Yahoo, & Bing. Michelle Duplechan & Jenn Foster willingly share their knowledge and will guide and coach you to success in internet marketing. They have helped many businesses over the past several years and continue to consult Doctors, Lawyers, Dentists, and other business owners! Michelle Duplechan & Jenn Foster will share the 7 Marketing Strategies to Attract New Clients. Michelle Duplechan is dedicated to helping your business grow by combining various online and offline methods. Her company Duplechan Marketing Solutions will bring more qualified leads through your door and help you build relationships with your prospects and customers. By using powerful tools such as online video and automated systems to capture leads and follow up with them automatically, she will help to create trust with your prospects and clients and keep them coming back to you over and over again. She is also the host of The Moms in Business Talk Show, a podcast show dedicated to moms who own their own businesses where they share the joys and challenges of raising their children while building their businesses, as well as give encouragement and helpful tips and resources. When she is not helping clients, Michelle enjoys spending time with her 2 teenage daughters, reading, hiking, and working out. Jenn Foster is one of today’s national leading online and mobile marketing experts. She is the founder and CEO of Biz Social Boom, a company dedicated to helping business owners of all sizes thrive in today’s highly technical world of product and service promotion. From local brick and mortar stores to online entities and to large international corporations, Jenn’s years of experience and expertise has helped hundreds of others become the front page news on all of the major search engines. She is dedicated to helping businesses use powerful new online and mobile marketing platforms to get visibility, traffic, leads, customers and raving fans.A graduate of Utah State University, Jenn is an award-winning web designer, author and sought-after speaker. She has been a featured speaker at such events as the Kim Flynn’s Internet Marketing Boot Camp, Utah Crowd-Funding Association and the Sandy Area Chamber of Commerce among others. She has been on stage as an expert marketing panelist for marketing experts Mike Koenigs, Ed Rush, Paul Colligan, and Pam Hendrickson. She was also an expert guest on the Teach Jim Show on Blog Talk Radio. Jenn has been a guest on multiple podcasts shows including Instant Authority Expert with Keith Shannon, Stephanie Bavaro’s Greatful Women Talks, Online Marketing Guy Livecast by Steven Laurvick, The Moms in Business Talk Show with Michelle Duplechan and many more. Jenn has been named one of America’s Premier Experts® and is a co-author in the book Stand Apart with Dan Kennedy, a major national publication, and an Amazon Kindle best seller. Jenn recently received a Quilly Award in Hollywood from the National Academy of Best Selling Authors, for her contribution to the book. Coming from a family of successful entrepreneurs, Jenn grew up around thriving businesses and understands what it takes to create, run and promote winning companies from the ground up. Combining her education, knowledge and life-long experience, today Jenn teaches people and businesses globally how they can get found in today’s virtual world, how they can engage prospects on their terms and how to continue to connect and follow up with prospects to convert them to customers. By utilizing her proven techniques, Jenn confidently guarantees her clients will be on the first page of Google Search in their local market. When she is not helping her clients, Jenn enjoys spending time with her three children, sewing with her family 4-H club, experiencing the great outdoors and she loves Zumba. Stand Apart: Stand Out From the Crowd to Achieve Ultimate Success. Featuring Dan Kennedy, Jenn Foster and Leading Experts From Around the World. Michelle Duplechan & Jenn Foster, Duplechan Marketing Solutions, Biz Social Boom, internet marketing, video marketing, online marketing, mobile marketing, Video Marketing for Veterinarians.